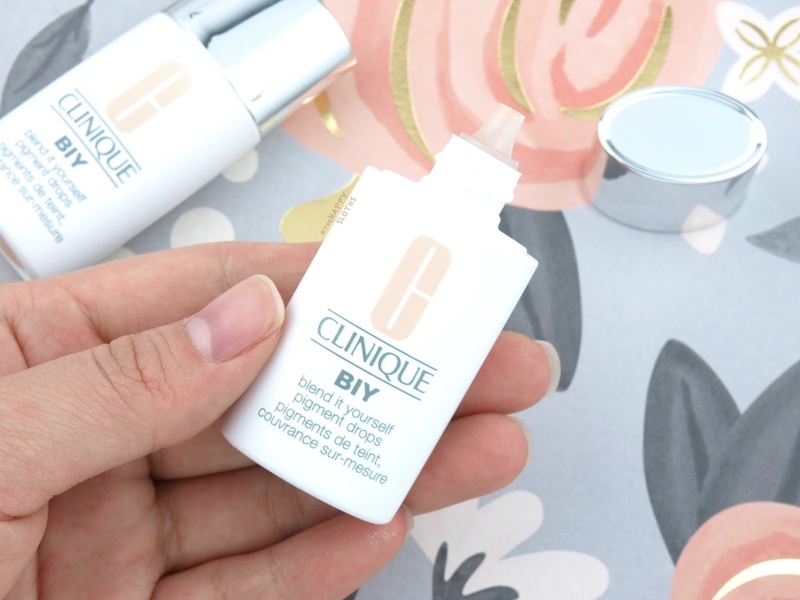 Clinique BIY Blend It Yourself Pigment Drops in "110" & "115"
The BIY Blend It Yourself Pigment Drops is housed in a teeny tiny 10ml bottle. The bottle is squeezable and the product dispenses from a small spout opening. The packaging is super travel-friendly because instead of a full-sized foundation, you can just bring one of these little guys and mix it with your usual moisturizer. 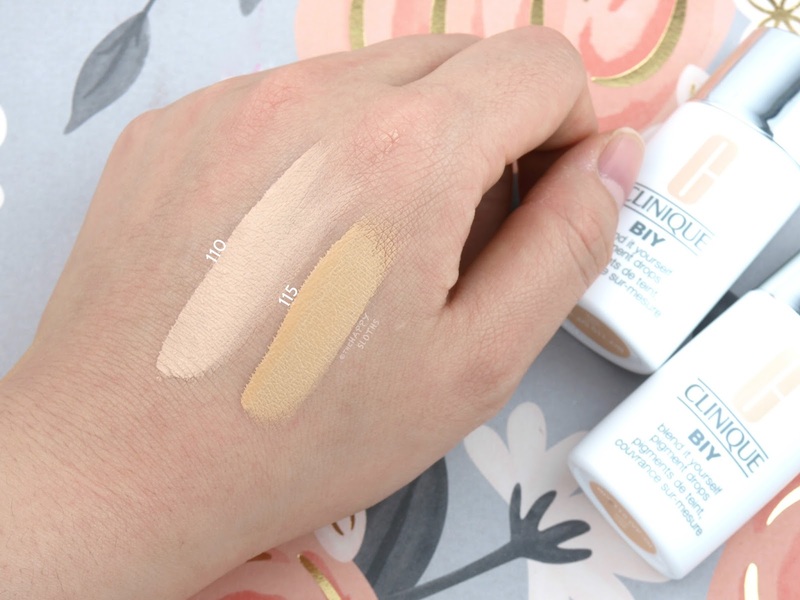 Designed to be mixed with your favorite moisturizer, the Clinique BIY Blend It Yourself Pigment Drops is a runny liquid pigment available in 11 shades. Because of its name and intended use, I was expecting the BIY Drops to be super pigmented. Unfortunately, the product is a lot less concentrated than I had expected. The opacity is equivalent to a full-coverage foundation, so you can probably use the drops just on their own. 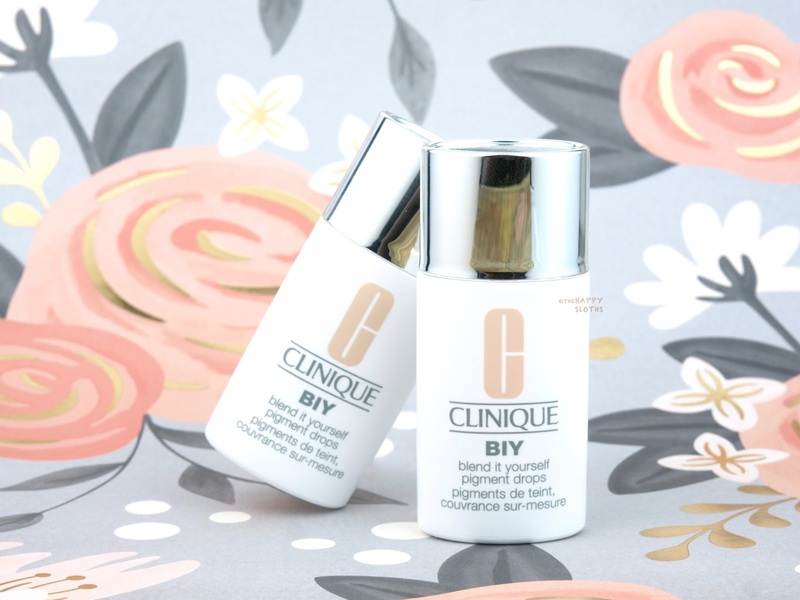 Clinique advises having one, two, or three drops of the product to be mixed with your favorite moisturizer. 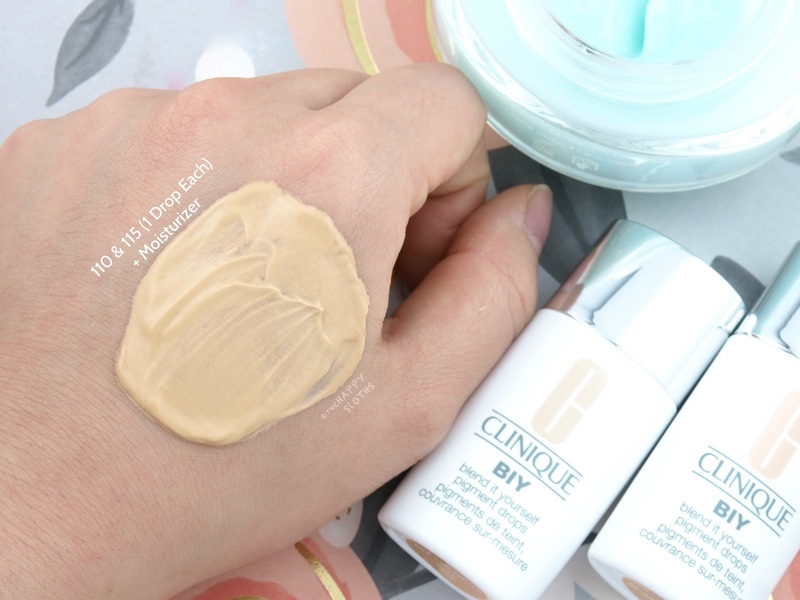 One to two drops for a BB or CC cream coverage and three drops for a fuller foundation coverage. In the swatches above, I mixed one drop of "110" and one drop of "115" with the Dior Hydra Life Fresh Hydration Sorbet Creme. What resulted was a super sheer coverage that I was only able to spread over one side of the face (see the before and after swatches below). The drops provided a bit of a tint but it's actually sheerer than any BB creams I've tried. When I actually gave this product a proper test-drive, I ended up using six drops of the BIY, which provided a sheer to medium coverage. I could have obviously added more drops, but considering one bottle only contains 10ml and 1ml equates to roughly 20 drops (according to Google), you only get 200 drops per bottle. If I end up using 10 drops per application to attain a full coverage, I really only get 20 uses out of one bottle. Aside from the sheer coverage, I experienced a bit of streaking and unevenness, which may be related to the moisturizer I used. Another drawback of the product is the small shade selection. "110" is a light ivory similar to an NC or NW 15 to 20 while "115" is a much deeper warm beige. I landed somewhere in between so to get a perfect match, I would have to use both shades and since they are $44 CAD a pop, things can get pretty expensive! All in all, despite its sheerer coverage, I actually quite like these. My main struggle when it comes to finding a good foundation is that most formulations end up looking greasy and icky by the end of the day. So being able to choose my own pigment base by selecting a moisturizer that I know works well with my combination skin, I am able to get a nice, shine-free wear. I also didn't notice any oxidation, so the pigment colors remained unchanged throughout the day. So what are your thoughts on a BIY foundation? Share with me your thoughts below!